I’m linking up with Focused on the Magic’s Wordless Wednesday Blog Hop today! My very favorite parade is the new Festival of Fantasy Parade, but I’m featuring one that I haven’t posted many pictures of before: the Main Street Electrical Parade. This parade is beautiful. So much impressive technology that I don’t even understand goes into the timing of the music and the lights. It truly is a sight to see! I love this canopy and lighted costumes! It’s one of my favorite parts! I always wondered why Prince Charming got stuck with the Stepsisters! Would you like to be Pete and sit waaay up on Elliot’s neck? Thanks so much, Deb, from Focused on the Magic for hosting Wordless Wednesday each week! Check out the other posts on my site while you’re here, follow me on Pinterest, Twitter, like me on facebook, and/or subscribe to my blog. (You’ll enjoy Daily Doses of Disney on my facebook page!) 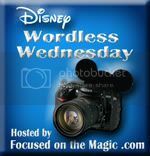 Then, don’t forget to click on the Wordless Wednesday icon to check out more Disney blogs and their Parade posts! The MSEP is getting a lot of love over on Deb’s Blog Hop! Totally understandable. So bright and beautiful and fun! Elliot is one of my favorite “floats” of the parade! Thanks for sharing your pics! I noticed that too! I thought the posts would be full of the Festival of Fantasy Parade, so I tried to feature MSEP instead. I guess great minds think alike! It is a beautiful parade. Elliot is such a great part of it too. Pete’s personality is so cute–and he’s so brave for being up that high on a moving float! Love the MSEP! Your pictures came out so clearly and you really captured the magic of the festivities! Thank you! It is pretty magical to see all of those bright lights and characters moving along the street. Great parade! I love watching the Electrical Parade during extra magic hours when the crowds are thinned out. I agree, Pete has a tough job sitting so high up. It’s definitely a job for the brave. Alice riding on top of the mushroom is another daring position. Thanks for sharing your photo’s, you got some great shots there. I particularly like the one focussed in on Tink’s float though, it’s a different perspective and I have never really noticed those flowers before! Your first Disney parade does create special memories, doesn’t it? I’m glad you enjoyed the pictures! I just love Tink’s bright, big flowers! Thanks for the comment, Penny!